ANTIDOTE, founded by Sophie Zembra in Miami in 2017, is a fashion boutique that only offers ethically made products. It has a store in Wynwood district in Miami as well as an e-commerce platform. Sophie sources interesting and up-and-coming designers from all over the world. Some of the key eco-conscious qualities include fair trade, sustainable, recycled, artisanal, vegan, and more. To truly build a community and raise awareness on ethical living, ANTIDOTE invites strong and inspiring women to speak at its Morning Stories series and hosts other events throughout the year. What is your background before founding ANTIDOTE? I wanted to start working really early, so I started working when I was 14 at an atelier making stained glasses. I was studying part time in school and working part time at the atelier. I need to find good colors to mix, so the process made me become more creative. After that I moved to interior and textile decoration. That was my first contact with fabrics. In the past few years, I created a lot of companies – not everything ended up working well. I created my first company called France Vitrail when I was 18. It is a company that that makes and restores stained glasses and stained glass windows for individuals and companies. Then I moved to Paris and created another company France Résille, which designs and installs laser and jet sliced patterned panels and wall façade on buildings. Right before the birth of ANTIDOTE, I created Shopethik. It’s a market place in France that is entirely dedicated to ethical active wear. I worked on it for five years. It was really my first experience with fashion and e-commerce. It was a unique experience, and one that got great feedback. But I was really missing the artistic component and thought it was really boring to only sell white organic t-shirts, so I sold Shopethik and decided to open a retail store where I can tell my story more creatively. Entrepreneurship is really a part of who I am. I’m born with it. I never imagined myself working for someone else. I wanted to create something by myself and build my own team. At the same time, during these five years doing Shopethik, ethical fashion changed a lot. I saw more and more creativity coming. I began scouting the market for ethical brands for personal use, so I already had a list of designers. When I spoke to people, they were all amazed at all these brands I knew but nobody else knew. I was thinking if there was something for the fashion people who didn’t know, and I thought it was time to do something about it and share these designers. How did you come up with the name ANTIDOTE? We are playing with the meaning of the word "antidote," which is a medicine taken or given to a counteract a particular poison. ANTIDOTE is the remedy to challenging the notion of conventional fast fashion. How did you approach the concept? I didn’t imagine my life in fashion at first. I wasn’t really interested, and it was too different from what I was doing. But I was interested in fabrics, especially innovative fabrics that are ethical conscious. When I worked in textiles, I traveled frequently to visit factories and saw first hand the pollution and unethical manufacturing practices, and I didn’t feel comfortable having those textiles close to my body. So ethical fashion is something that really makes sense for me. It was really a challenge. I had a lot to prove. Nobody knows much about ethical fashion. It's also a whole new world. There are lots of new innovative fabrics. For me, ethical fashion is not just being ethical or doing something good. It’s also thinking about the future because in the future, everybody will be ethical. I’m very positive. I don’t want to just show the program because everybody knows the program. I want to show the solution. You are from Paris and never lived in Miami. Why did you choose to open the store in Miami? At first I was thinking about creating ANTIDOTE in Paris. But there are already a lot of places selling basic white t-shirts and active wear in the market. Nobody needs me. I also lived in Paris for 15 years and thought it was getting boring. At the same time, my husband and I wanted to start a new challenge in our personal life. We thought it was the best time. I just sold my last company, so we had money and thought we should do something with the money. We were thinking: should we start again in Paris or should we move? We decided to move but didn’t know where. At first we were thinking maybe New York or Los Angeles, but New York and LA are full of new creative concepts already. We had a friend in Miami and decided to go for a weekend to check it out. She showed us around, and we just loved Wynwood immediately and decided to move there. It’s new district, and it’s the best place for us. And Miami changed so much! I was really really impressed. The first time I was in Miami was 8 years ago. It was totally different back then. Now it’s a new energy and great city for the flagship ANTIDOTE store. We are looking to open more stores in the future in other cities too. How did you design the store? 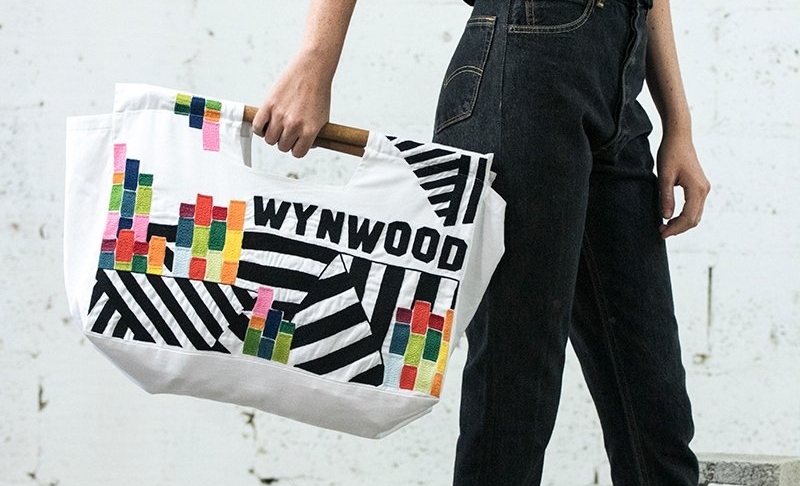 It took us one year going back and forth between Paris and Miami to really learn more about Wynwood. We worked with Atelier Deyavorsky to design the space. We are trying to have a typical eco-conscious style. We choose to be in Miami so that’s why we use pastel color. I want to create positivity at the store. Today life is very black and white. It’s nice to have colors. We don’t want minimalism. We want a really strong aesthetic to differentiate from our competitors. How did you choose the brands and products? First I try to mix different ethical values. For example, some are artisan, some are fair trade, and some are vegan. We really find brands from all over the world including Africa and Lebanon. When ti says a brand is a recycled brand, it’s not that they use an old cloth and make new ones. It’s a really innovative process to create fabrics. We also try to get different eco-friendly materials. Then we choose because of the style. Like all fashion companies, design is very important to us. The story behind the brand is very important too. I want to give values to clothes. How does being in Miami make you approach things differently? Miami fashion is totally different. Miami is a huge mix. We have a huge Latin influence. We also have a lot of people coming from other cities each weekend. It’s hard to define a typical Miami person. It’s a mix of a lot of culture. That’s what I like about Miami. 50-60% of our customers are actually from New York, but we are also selling to Colombian and Chinese for example. Antidote just launched its own clothing line. How did you develop the private label? We recently launched our first private label tee "I'm With Earth" in honor of Earth Month. Having Miami as our home, we are blessed with beautiful beaches and stand proud to support them. We want to use new and innovative materials, so we tested many different materials. What makes our Tees especially eco-friendly are it's production processes. Our Tee is made in California with 100% organic cotton, printed by hand with eco-friendly, water based inks, and embroidered in Miami. We want to make a tee that looks as good as it does, so we give back 10% of sales to the Surfrider Foundation and aims to protect the world's oceans. Right now we are just doing t-shirts to start, but we will expand into a full collection. I actually found her in Paris through my friend Alexandra Senes (READ THE INTERVIEW WITH ALEXANDRA SENES). She is Venezuelan and lives in Miami. She was interning for Alexandra at the time but was going back to Miami in April. I was going to Miami in April too. So Alexandra recommended her to me, and we met. She has really helped me a lot. How big is your team now? What are their roles? Today we have five employees. There are two sales associates in the store and three at the office. I’m really focusing on e-commerce and trying to become a national brand. E-commerce is so important to us, so we have one person managing e-commerce. There is one person doing graphic design, and we just started creating our own clothing line as well, and she helps with that. Another person focuses on PR and events. You travel a lot. How do you manage your team when you are always away? I communicate a lot with my team. Even when I’m traveling, I make sure that we talk a lot over Skype. I want to be inspiring for them, and I also understand that nobody is perfect. I know what I need, and when I know what I need, I can find the right people for that. We market our story and emphasize why we are different. We use social media to send our messages. Instagram is a major channel for us to share who we are. We also send out an email newsletter every week. We do a lot of different events, usually 3-4 events per months. We do workshops, but we do have one specific event that we do every month. It’s called Morning Stories. We invite a strong woman from Miami, not necessarily in fashion. For example, we had a writer and a vegan chef before. We offer coffee and pastries. It’s a really intimate setting. We really take the time to speak to everyone. I like speaking about the entrepreneur path and hope to empower people. Every time we host it, it’s a big success. We are always full. Afterwards, we take pictures and chat with each other. We don’t just want to be a store. We want to create a community. It’s an experience at the store. You are not just here to shop, you are also here to speak to us and learn more about ethical fashion. It’s not just buying, because today we actually have to buy less. I want to create something really strong. How were sales when you first opened? We had a big opening and did a lot of press release. It’s a great start. The good part of Miami is that it’s not a city full of concepts. We quickly have a strong group of people coming to us. There are many people returning. How do you balance sales between brick-and-mortar and e-commerce channels? I have a background managing an e-commerce with my previous company, so it’s actually the easier part. We create our own packaging and wrap the products with tissue. We include a card with our store address. We have to grow both online and in store and create a omni-channel experience. That’s why in store, we try to speak about online, and online we advertise the store. People are also more confident when they know we have a physical location. Retail for us is a window to explain to people who we are. How do you manage the competition with other Miami fashion boutique stores? They are really different. Today there aren't any stores dedicated to ethical fashion in Miami. Everyone knows The Webster and compares us to The Webster, but The Webster is very different. We don’t have the same target customers. Of course it’s an important and strong shop. There are not many stores in Miami. Also we are in Wynwood. We want to be a part of Wynwood. There is a new Miami for us. There are a lot of people in Miami interested in ethical clothes, but they just didn’t know where to find them. My background helped me a lot. I learned through experience. I wasn’t good at everything. I learned because I failed before. At first it was the language and the culture. Then I had to create a new network in Miami. I didn’t know many people there. It’s actually easier to do that in Miami because people are more open and friendly. Everything was new and different for me, but it was also very exciting as well. I need to get out of my comfort zone. That’s how I become better. You have to find good people and mix everybody in order to build a good team. When you first start your company, everybody wants to give you advice. But your company is about you. You need to create your own way to manage. Don’t be shy. Don’t be scared. The worst is failing, but at the same time you learn. Just follow what’s on your mind.